I’ve included these under ‘Breakfast’ because they make a great grab & go meal for when you are having one of those mornings, but this can equally make a great lunch or light dinner with a salad. You could make so many different flavour combinations. Choose your favourite ingredients & experiment to see what works – I’ve suggested a few of mine at the bottom of the basic recipe. They are done when they are a golden brown colour on top. Remove from the oven & put on a rack to cool slightly. These can be made ahead & kept in the fridge for 2-3 days and they also freeze well. For general use I make these in conventional size muffin tins, which is a good size to grab quickly if flying out of the door & also great to have stashed in the freezer, however I quite often make them in a small muffin tin – brilliant for picnics or party food. If I am serving this as a main course, I’ll make a large one in an oven proof frying pan following the same instructions as above, but start the cooking process on the hob first to cook the bottom & then place in the oven for 10-15 minutes to allow it to cook all the way through & brown the top. Tomato & Basil ~ Add 2 good tbsp of pesto to the egg mixture & chop up 3-4 (dependent on size) large tomatoes, discarding the pips & any juice. I also like to add goats feta cheese chunks to this frittata also. Put a little of the feta & tomato chunks into each muffin hole & pour over the pesto/egg mix. Follow the cooking instructions as per the basic recipe above. Salmon & asparagus ~ Chop up a good handful of fresh dill & add to the basic egg mix. Also add the zest of 1/2 lemon together with 1/2-1 tbsp of the juice, depending on how lemony you like it. Lightly steam some baby asparagus & chop up into bite sized pieces. I reserve the tips & add them at the end ~ not compulsory, but looks pretty! Flake some cooked salmon into each muffin hole along with some of the chopped asparagus. You could also add some chopped capers, which add a little zing. Pour over the egg mix & follow the cooking instructions as per the basic recipe above. I’ll be adding more variations on a frittata over the next few weeks, so please keep an eye on this recipe section. 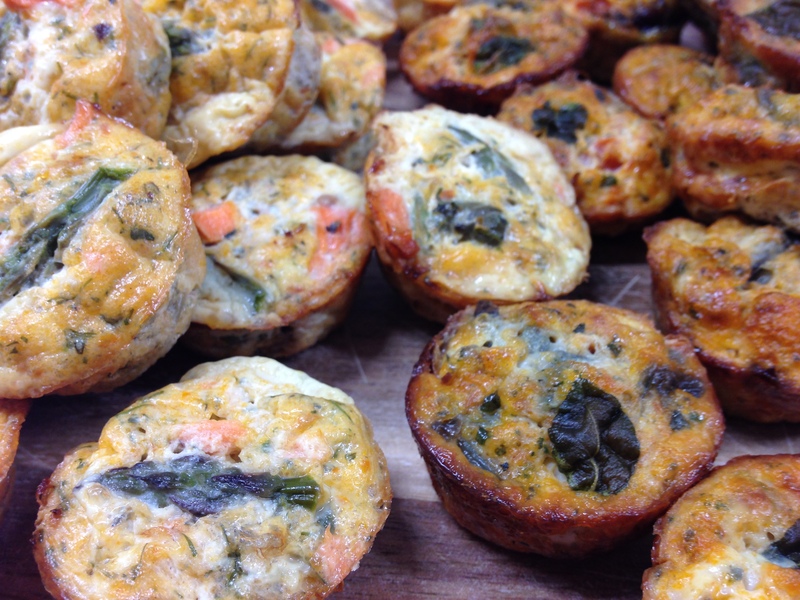 If you have a favourite frittata flavour, I’d love to hear it!